We’ve decided that April is Sock Month here at Interweave! We’ll be talking about socks all month, and we’d love for you to join in the conversation! As part of the celebration, we’re releasing two kits from Sockupied Spring 2015, both featuring Mone Dräger’s awesome Chains Socks. We’ve partnered with Huckleberry Knits to bring you their awesome sock yarn, Willow, in either North Fork (the green semi-solid) or Mercado (the bright variegated). I started my knitting career primarily a sock knitter. I went through the scarf knitting phase most beginning knitters do. I started reading Interweave Knits almost as soon as I started knitting, and one day I came across Ann Budd’s On Your Toes socks in Interweave Knits Summer 2007. I’d made only one pair of socks before this, but this sock pattern pretty much changed my life—well, as far as my knitting goes. 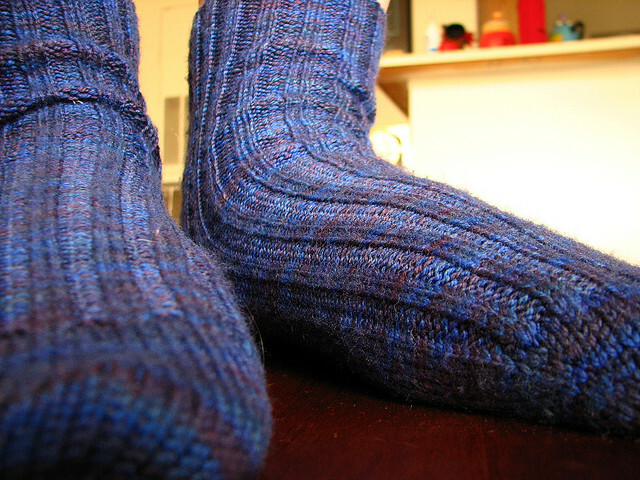 To this day, I don’t consider myself a toe-up or top-down sock knitter, but Ann’s socks were my first pair of toe-up socks, my first time doing a short-row heel, my first time making socks for me. Here’s an absolutely terrible photo—sorry about that. These is also the first, and to this day, only, sock pattern I’ve ever referred to more than once, though on my second go I only used the numbers and knit plain stockinette socks. That, to me, is the beauty of sock knitting. Within a finite amount of space, we can play and experiment and try out new things, learn new techniques. I hope you’ll join us in celebrating Sock Month here at Interweave! We have a lot more to talk about.